Plus Size Costume Shop carries a full line of professionally hand-made Halloween costumes, Renaissance garb, Christmas costumes and historical clothing in sizes 0X (14/16W), 1X (18/20W), 2X (22/24W), 3X (26/28W), 4X (30/32W), 5X (34/36W), 6X (38/40W), 7X (42/44W), and 8X (46/48). The witch hat and cape are NOT included! The bodice is made of black heavyweight twill and is lined and boned at the lacings. It laces up through professional-strength grommets. The peasant shirt is made of black cotton and has elastic in the sleeves and neckline (gothic sleeves do not have sleeve elastic). The shirt length is approximately 32” or hip-length. You can choose short sleeves, long sleeves or gothic sleeves (default). The underskirt is made of black cotton and has an elastic waist. The skirt will come hemmed at 44" (extra-long - usually will work for someone up to 6'2" tall) unless a shorter length is requested. The overskirt is made of silver sequin dot fabric. The skirt has an elastic waist for comfort and will come hemmed at approximately 22" at the longest point unless a specific shorter length is requested. 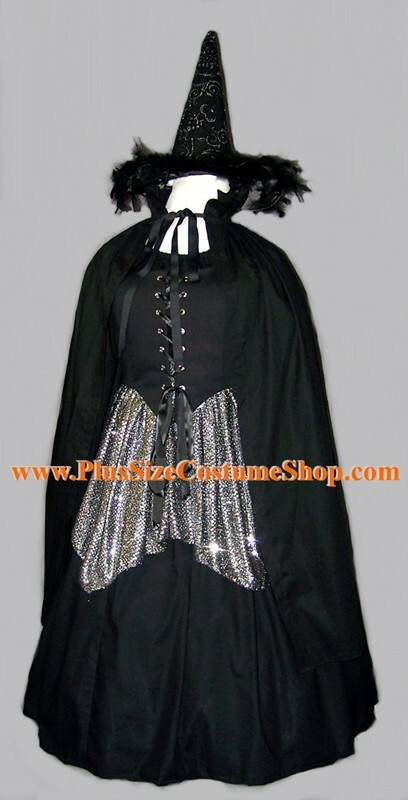 Please see our capes page to add on this black stand-up collar cape to your costume!